A bay area woman goes to the hospital for stomach pain and she racks up a nearly $23,000 bill in just two-hours. She fought the charges and ended up having them greatly reduced. “They did a CT scan and some blood work,” said Karen Ford, describing her visit to the Emergency Room at Oak Hill Hospital in Hernando County late last month. She was referred to the hospital by her primary physician because she was experiencing abdominal pain. “It was nothing life-threatening and they discharged me. I think it all happened within the space of two hours,” she said. Ford thought her Blue Cross Insurance plan would cover most of the costs. She said that her doctor didn't tell her Oak Hill was out of network and neither did anyone at the emergency room. Ford didn’t know there was a problem until she received a bill for nearly $23,000. 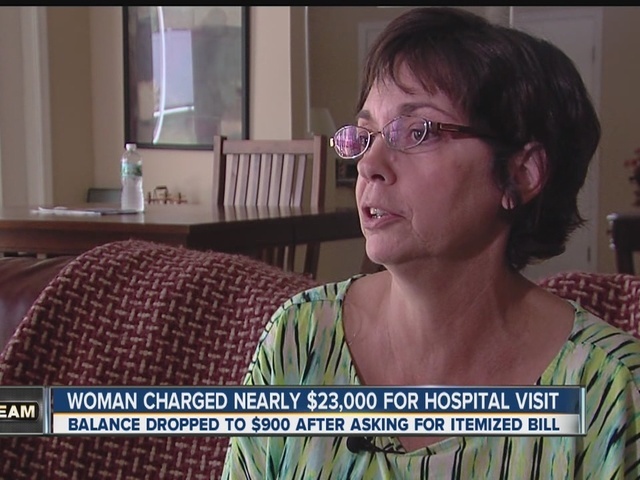 Her insurance company only paid the hospital a little more than $1,200. The biggest item on the bill was an abdominal CT scan, which cost about $19,000. The website Healthcare Bluebook, which tracks the costs of procedures, says the average price of an abdominal CT scan in the Bay area is about $730. A recent John Hopkins University study ranked Oak Hill 10th in the nation, when it comes to pricey medical procedures. 20 of the country's 50 most expensive hospitals were found in Florida, more than a quarter are owned by Oak Hill's parent company Healthcare Corporation of America, or HCA. Ford took action on her own. “I think the squeaky wheel does get the grease,” she said. Ford demanded her itemized billing, which she told the hospital would be used to file a complaint with the state and would be used by her attorney to file a lawsuit. After that, her bill was reduced to just $822 with no explanation. “You have to question everything, because if you don't, then they're going to send you the $23,000 bill,” Ford said. The amount patients pay for hospital services has more to do with the type of medical insurance coverage they have than prices listed in the charge master. Government programs like Medicare and Medicaid determine how much they reimburse hospitals, and insurance plans negotiate rates. Uninsured patients are eligible for free care through our charity care program or they receive our uninsured discounts, which are similar to the discounts a private insurance plan gets. In addition, we were one of the first providers to make detailed pricing information publicly available; we have been providing this information on hospital web sites since 2007.